Sunday night, R&B star Chris Brown, who has been keeping a low profile since last year, broke down while performing a surprise tribute to Michael Jackson at the BET Awards. The audience was very much on Brown’s side, helping him sing the lyrics to “Man in the Mirror” when he was overcome with emotion. “I think people felt, in terms of the dance tribute he did, I think people enjoyed that and were reminded that in spite of his past behavior and actions that he’s a talented person,” a reporter says. His career has yet to reach its former heights. In December, he released his latest album, “Graffiti” and to date, it has sold fewer than 500,000 copies, poor even in a time of diminished album sales. None of its singles have hit the Billboard Top 10. Brown, who turned 21 at the beginning of May, often hasn’t helped his case. He’s been a frequent social network user, often using services to either apologize or vent — that is, when he wasn’t leaving them entirely. 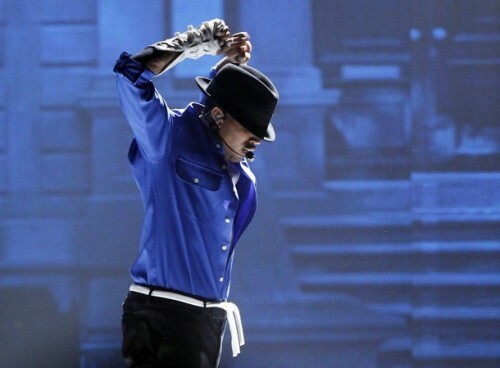 Chris Brown paid a tearful tribute to his idol, music icon Michael Jackson, with an emotional performance at the 2010 BET Awards on Sunday night. The controversial star sang and danced his way through a 7-minute medley of the late King of Pop’s hits at the urban awards show. Brown, 21, broke down in tears while performing Jackson’s 1987 anthem “Man in the Mirror,” drawing a standing ovation from the mesmerized audience at the Shrine Auditorium in Los Angeles. Chris Brown’s infamous attack on ex-girlfriend Rihanna is coming back to haunt him: The “Kiss Kiss” star has been banned from the United Kingdom. The trek was due to begin in Glasgow on Wednesday, before making stops in London, Birmingham, Manchester, and Cork and Dublin in Ireland. “Due to issues surrounding his work visa, (the) Ireland and United Kingdom leg of Chris Brown’s Fan Appreciation Tour has been postponed. Chris looks forward to performing for his fans abroad in the near future and thanks them for their continued support,” a statement from Brown’s spokesperson reads. Oprah has called on Rihanna to take part in her show dedicated to Haiti. The pop star, along with Maxwell, will perform on Wednesday’s program. Wyclef Jean will also be on hand to show the devastating footage he witnessed firsthand and address the allegations against his Yele Haiti organization. New to the upper tier is Rihanna‘s “Hard,” featuring Jeezy, which has moved from 15-9. The track is Rihanna’s 13th top 10, tying her with Beyoncé for most top 10s by a female on the Hot 100 since 2000. Her album, Rated R has also just been certified platinum. Congrats! 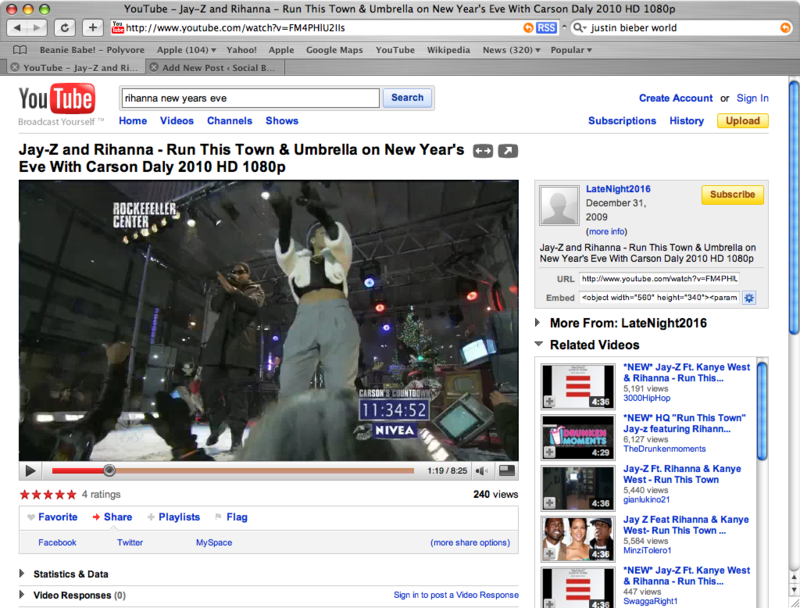 Rihanna performing her latest hit, “Hard” on New Years Eve with Carson Daily. 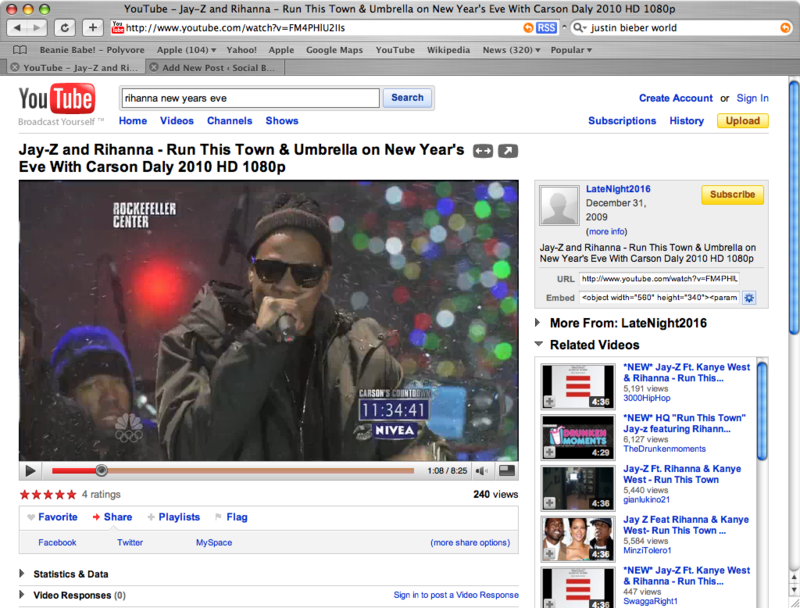 Jay-Z & Rihanna took over Rockefeller Center on New Years Eve to perform for The Carson Daily Countdown.